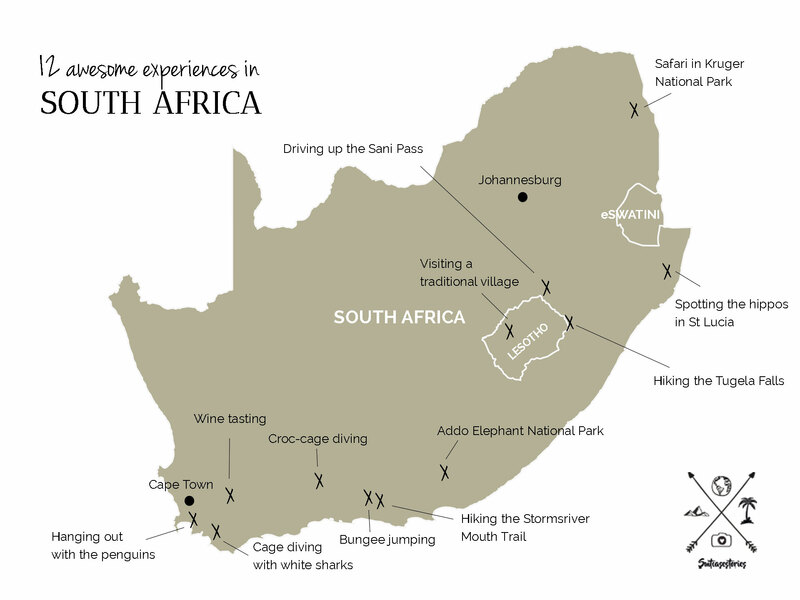 Are you planning a trip to South Africa? Then read on… Most people when they think about South Africa, they think about doing safaris and the spotting the ‘Big 5’. But South Africa has so much more to offer. Here are 12 awesome experiences personally tried & approved which will make your trip even more unforgettable. From hiking waterfalls to cage diving with crocodiles, visiting traditional villages and bungee jumping from the world’s highest commercial bridge. All listed on a map, making it easy for you to schedule them in your itinerary. There are many different ways to experience and enjoy South Africa’s world-famous game reserve, Kruger National Park. The most fun and cheapest way is a self-drive safari with your own (rented) car. You pay an entrance fee when you enter one of the 10 gates where you grab a detailed map and off you go… Another popular way is joining a guided game drive in an open safari vehicle. This one is more expensive but you don’t need to drive around by yourself and you have an experienced guide by your side. Both unique and great in their own way, in fact, we recommend trying out both if you have the time. Kruger National Park is famous worldwide for its scenery and home to all of the Big Five: the buffalo, elephant, rhino, lion, and leopard. 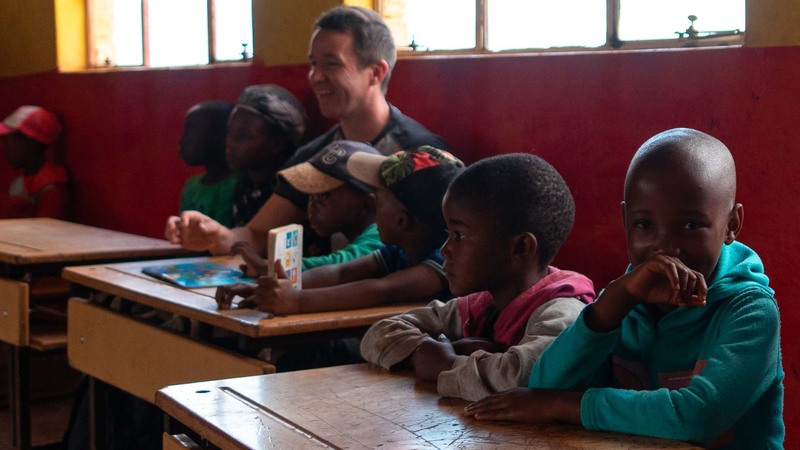 During our camping overland trip with Acacia Africa, we visited a traditional, rural village in Lesotho. More specific in Malealea, situated in a remote part of Western Lesotho. This unique experience was a great opportunity to see the traditional way of life. 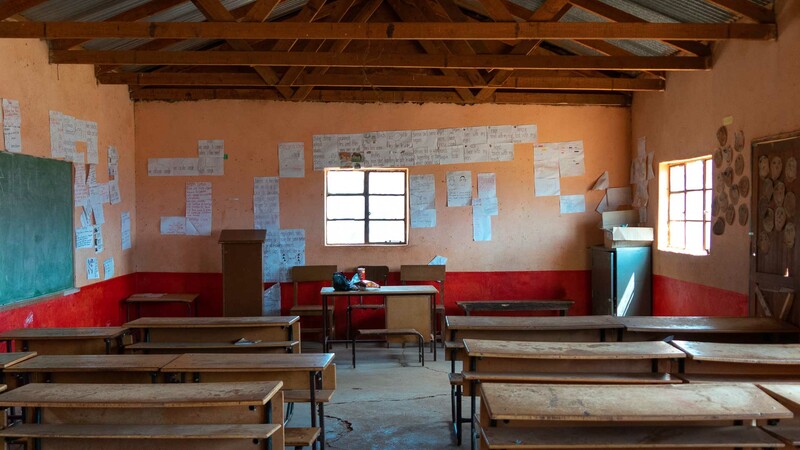 At Malealea Lodge they offer village tours, partnered with the Malealea Development Trust, which funds various projects that support their community. During this tour, you’ll be wandering through the village, visiting a traditional beer brewer, a cultural museum and a village school. A unique experience not to be missed! 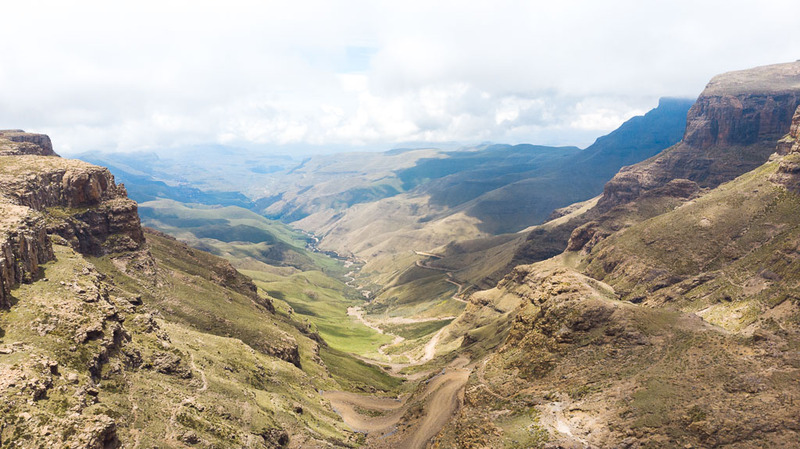 The Sani Pass is a very steep and twisting road and one of the most spectacular and scenic mountain passes in whole Africa. It takes around 2.5 hours to reach the top and can only be done in a 4×4. If your rented car is not suitable, you will not be allowed to begin the drive by the border authorities. (for your own safety!) 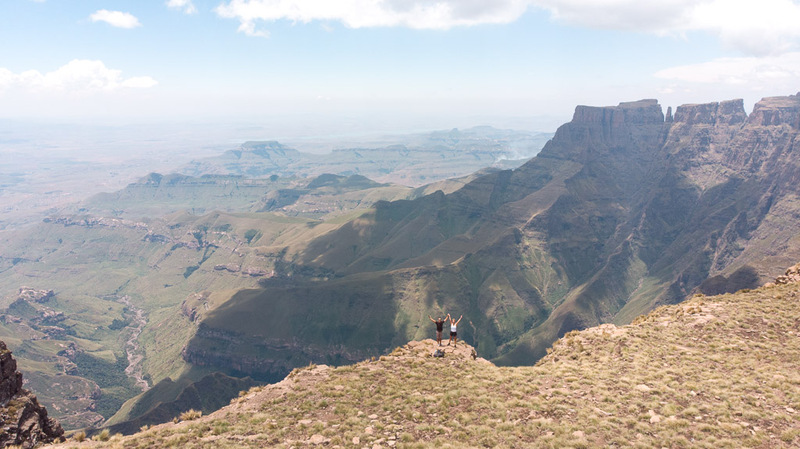 But don’t worry, because there are plenty of organized Sani Pass day trips. 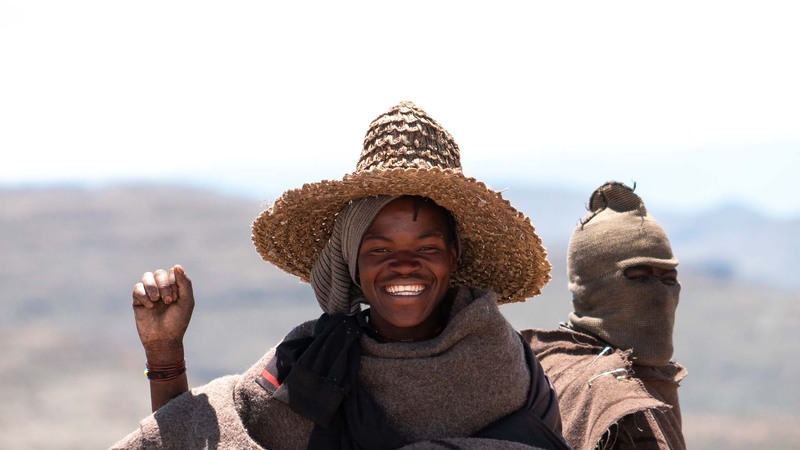 Day tours are usually leaving in the morning, climbing up 2874 meters above sea level into Lesotho. Along the way, you’re able to stop at different breathtaking views. And once you reach the top, you stop at the ‘highest pub in Africa’, also known as the Sani Mountain Lodge and the perfect spot to break the ride. 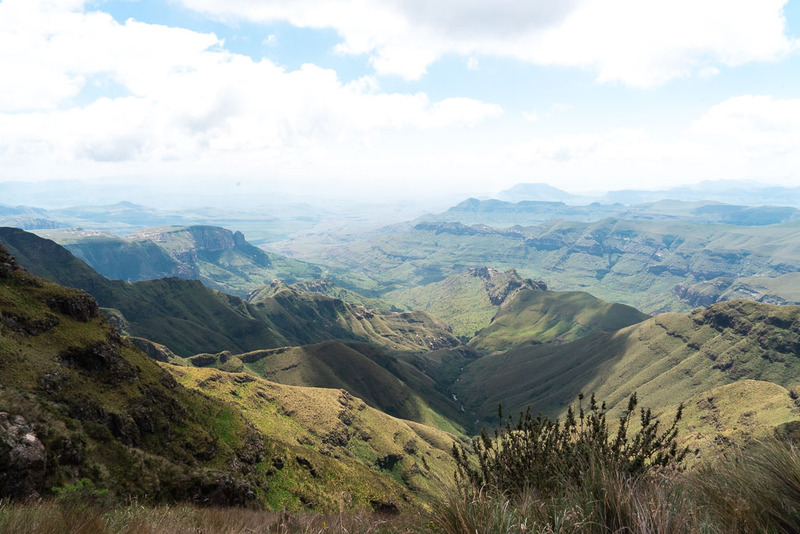 The Drakensberg Mountain range in KwaZulu-Natal is an absolute must do for all nature lovers and anyone searching for some adventure. 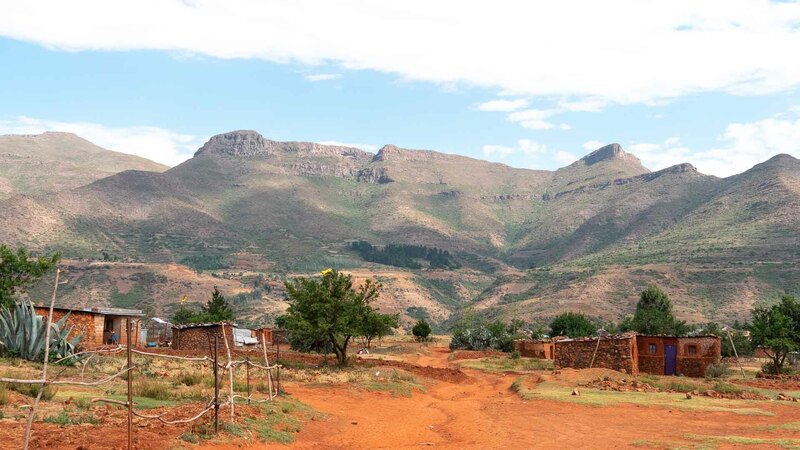 The mountains form the border between South Africa and the Kingdom of Lesotho and are one of the best places for hiking. 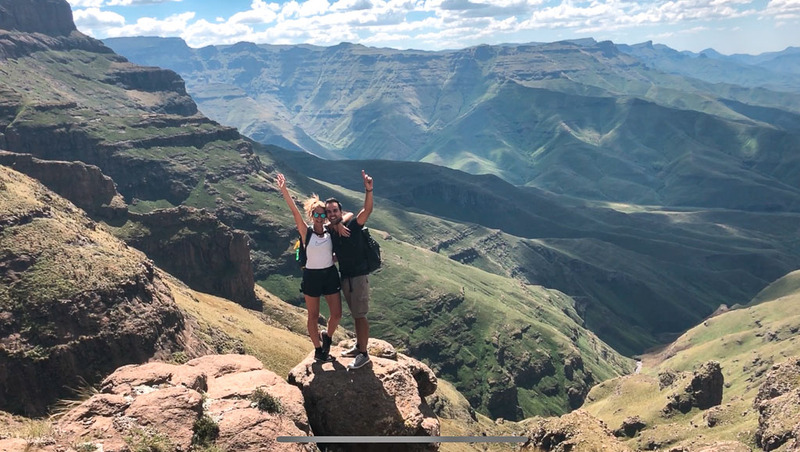 Drakensberg favorite trail and one that needs to be on every hiker’s must-do list is the 12 km hike up to the top of the Tugela Falls, at 3121 meters. The Tugela Falls is the highest waterfall in Africa and the 2nd highest one on the whole planet. The trail to it is pretty straight forward with a last steep climb to the top of the Amphitheater. You can also choose to take the chain ladders, which we took for the descent. Pretty scary, we have to admit. Anyway, the hike is all about the views and the spectacular rock formations. It takes about 5 hours to go up and hike back again. St Lucia is a super laid-back town off the north coast of the KwaZulu-Natal region. It’s part of the iSimangaliso Wetland Park and famous for South Africa’s largest hippo population. 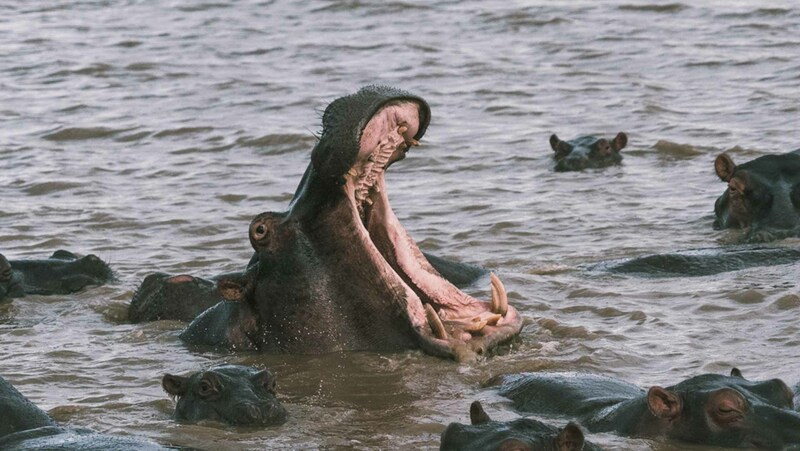 Over 800 hippos can be found here and the ultimate way to spot them is on the famous hippo & croc boat cruises. We took a 2-hour cruise in the late afternoon which we highly recommend. Located close to Port Elizabeth, Addo Elephant National Park is South Africa’s third largest national park. 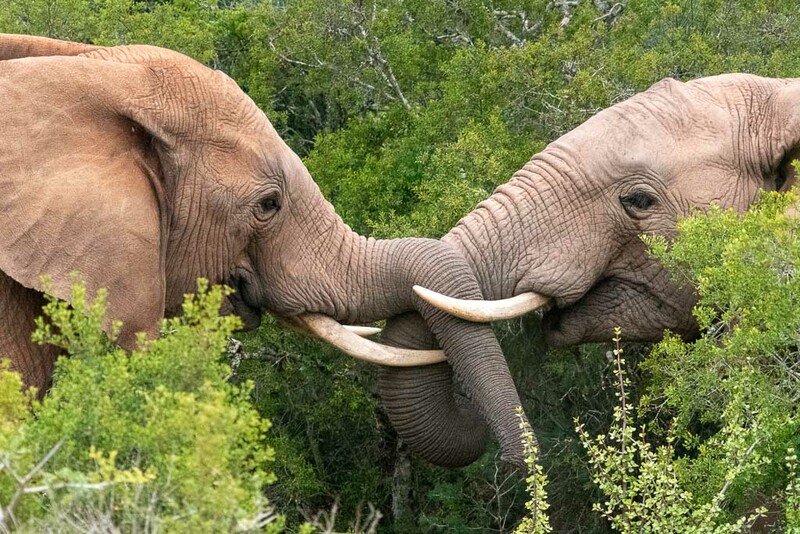 The reserve is home to South Africa’s largest elephant population, as well as the other members of the Big 7 (lion, leopard, buffalo, rhino, Southern Right whale and great white shark). 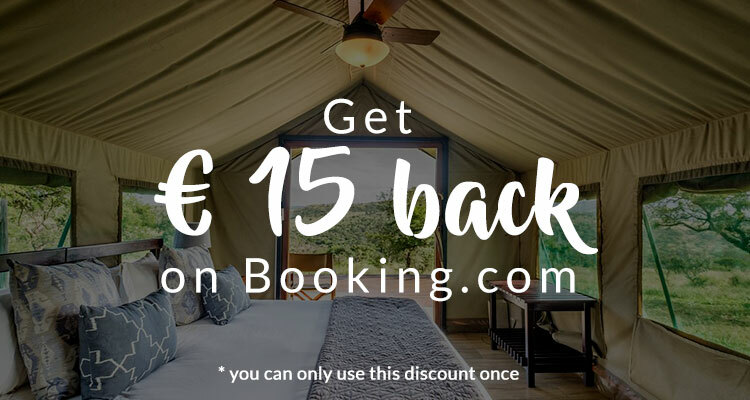 You can easily spend a couple of days here and same as for Kruger National Park you can do a self-drive safari here with your own car. South Africa’s Bloukrans Bridge bungee jump with Face Adrenalin was one of the craziest and most thrilling moments in our life. (and our first ever bungee jump) The bungee jump takes place from the top of the arch of Africa’s biggest bridge – the Bloukrans Bridge. 216 meters high, 6 seconds of freefall and over 100 decibels shouting, you guess it, this is a lifetime memory! Tip: wear comfortable clothing that you can jump with (no skirts) and decent footwear for the walk and zipline to the jumping point. 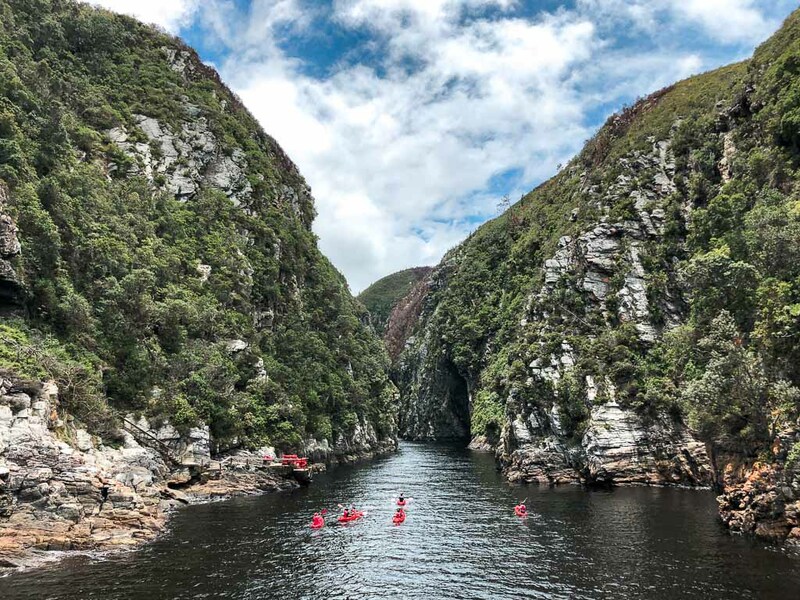 The Stormsriver Mouth Trail is the most popular hike in Tsitsikamma National Park. 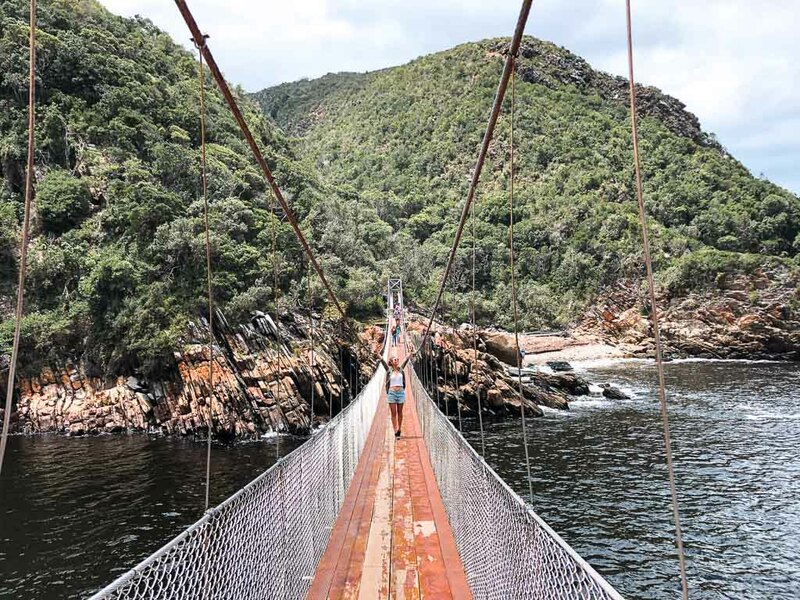 It’s a short 2 km hike and the highlight is the 77m long suspension bridge crossing the Storms River Mouth. For those with more energy, follow the trail and take the steep climb the to the lookout point. The views you’ll get are so worth the effort! 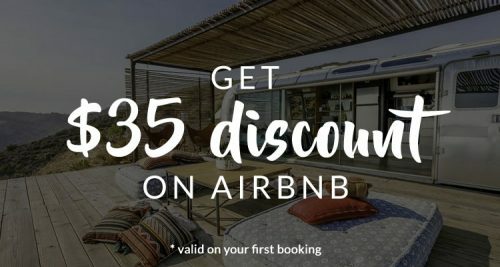 The Cango Wildlife Ranch is situated 3 km outside of Oudtshoorn on the scenic route R62 and famous for its animal encounters program where you can actually touch or hold different animals under supervised guidance. You can meet adult cheetahs, cheetah cubs, servals, snakes, chill out with the lemurs (Madagascar) or interact with a serval. A dream-coming-true for animal lovers! 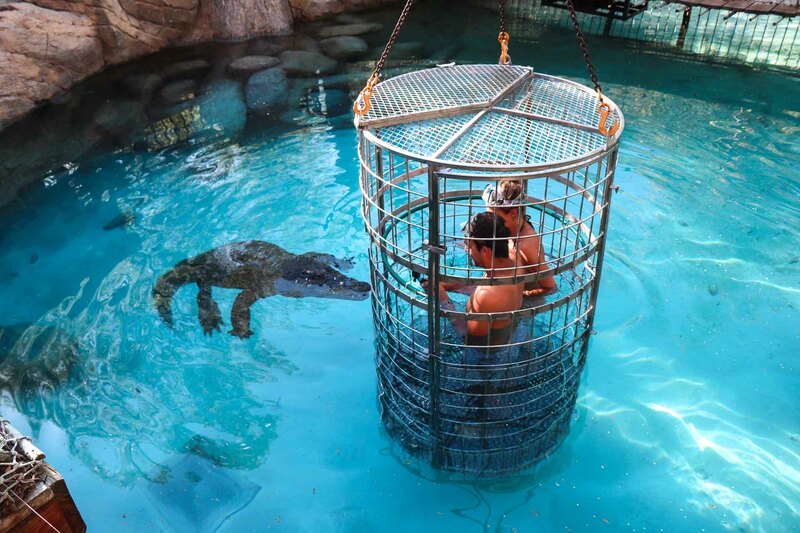 And the craziest experience at Cango Wildlife Ranch is the croc-cage dive with the 4 meter Nile crocodiles. A unique opportunity to come face to face with these impressive predators. Wine tasting is a must when you’re in South Africa. 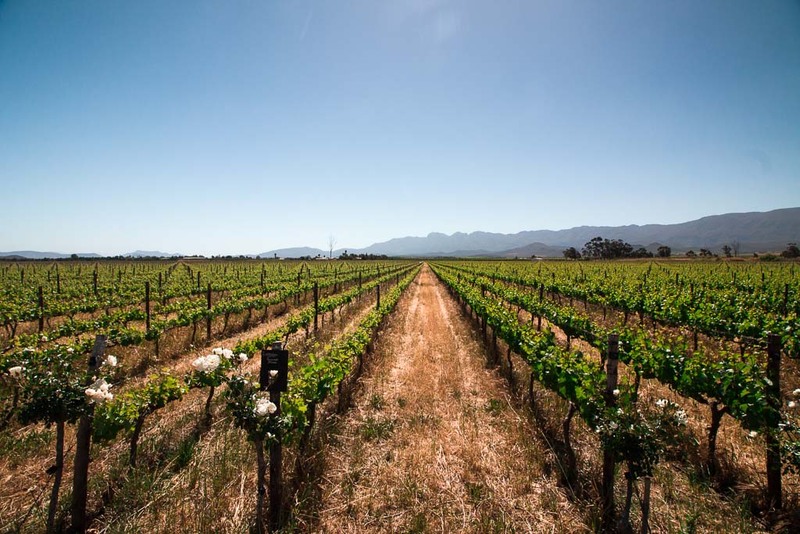 The Cape Winelands are home to some of the most prestigious wineries on the planet. The towns of Stellenbosch, Robertson, and Paarl are our favorites and can be found around 45 minutes from Cape Town. Be sure you stay for a couple of nights to explore the idyllic surroundings. You won’t regret it. We also wrote another article with some tips of wine tasting experiences, which you can read here. Looking for another thrilling experience? This is it! Shark cage diving in Gansbaai is such a unique opportunity to witness the wonder of the Great White Shark in a safe and professional environment. 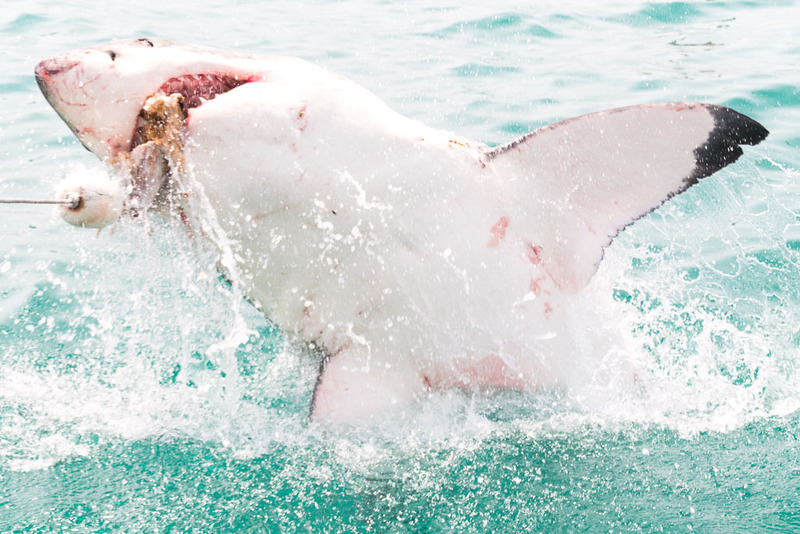 We booked our trip with White Shark Projects and wrote more about our experience here. Last but not least, when you’re in South Africa, don’t forget to pay a visit to the cute little African penguins at Boulders Beach. 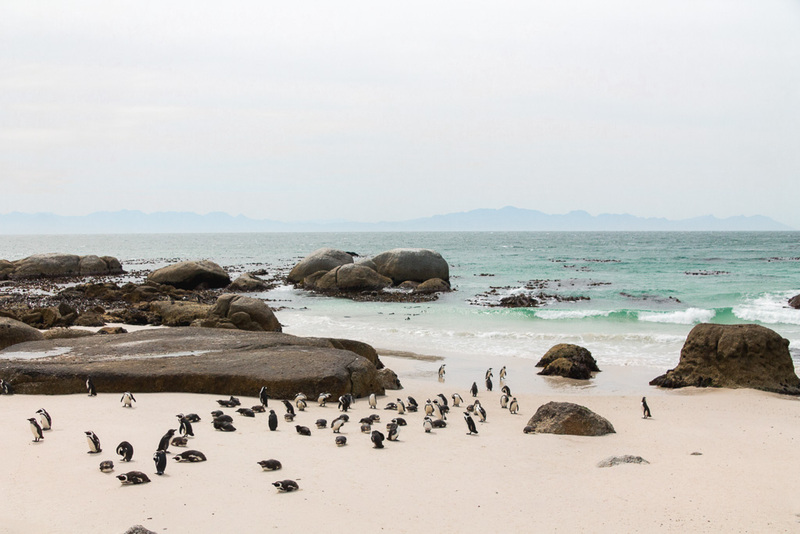 It isn’t just a great place for penguins, it’s also a family-friendly swimming beach where you can climb over the boulders, explore the rock pools, or swim in the cool, clear False Bay water. With or without the penguins. Unique!